Getting on the right diet plan that has been customized to your specific needs and goals is one of the best and most effective ways to lose weight. But if you’re like a lot of people, you probably aren’t sure about how to make a diet plan for yourself that will be healthy and tasty, so we’ve compiled a short step-by-step planning guide, which you can find below, to help you get started. Before you can make a diet plan for yourself, you need to figure out how many calories you will allow yourself to eat every day. This will depend upon your current weight and your weight loss goals, as well as your activity level. For example, if you are strength training and doing a lot of cardio, you could get away with eating more calories in order to get the energy for your workouts, as you will be burning those calories anyway. Next, depending upon how many meals you eat throughout the day, you need to split up the total calorie count across those meals. In this way, you will be able to then come up with a meal plan that will keep you within your calorie limits for the day. Breakfast could include one protein and one fruit. Lunch could include one protein, a vegetable and leafy greens, a starch, and a fruit. Dinner could include two proteins, a starch or grain, two vegetables, and leafy greens. Two snacks could include vegetables and fruits. Tip: There are a variety of helpful calorie counting apps available that you can utilize when you make a diet plan for yourself. Use one of those apps to input the foods that you want to include in your meal plan and to calculate the calories in every meal. In this way, you could take some of the guesswork out of the meal planning while ensuring that you meet your calorie goals. To make a diet plan for yourself, you need to figure out what recipes you will prepare throughout the week. Doing so in advance will help you stay on track, as you can avoid falling into the tempting trap of getting lazy about figuring out what you will eat on any particular day. Planning ahead is also especially important if you tend to eat at restaurants more often than you should. Basically, if you write out your plan, it will be easier to remember that you have goals to achieve. When you make a diet plan for yourself, you can introduce a lot of new recipes to your eating routine. That said, in addition to finding recipes that will be tasty and satisfying, as well as nourishing, it is very helpful to look for meals that will work on keeping you feeling full for a longer period of time. Doing so will help you stick to your plan without overindulging in snacks in between meals. Plus, feeling full longer is a great way to achieve your portion control goals while also restricting calories. It can be very challenging to make a diet plan for yourself that does not require the use of any nutritional supplements. So, to ensure that your body is getting the right amount of every important nutrient out there, taking some supplements could certainly be helpful, and these supplements will serve to enhance your healthy diet. 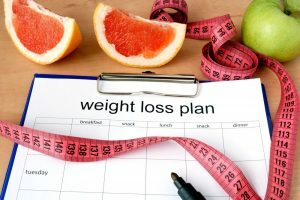 Just as you want to take your time to find the best recipes when you make a diet plan for yourself, you also want to take the time to research the weight loss supplements that you will be taking. • Purchase supplements from reputable sources. Make it a point to thoroughly research the producers of the supplements that you are thinking about taking. Doing so could help you be certain that they are using the highest standards for purity and quality. • Check customer reviews on supplements that you are thinking about purchasing. These could be helpful when it comes to figuring out if the supplements work or if they cause unwanted side effects. • Visit your doctor for a blood test to determine if you’re deficient in any nutrients, as that will help guide you towards the supplements that you need the most. • Take a daily multi-vitamin/mineral supplement as your foundation, but add in other supplements, such as antioxidants and fatty acids, for additional support. Tip: Talk to your doctor before taking any new supplements, especially if you are taking medications, as you want to be absolutely sure that the supplements will be safe to take. If you want to make your diet plan even easier on yourself, you can also prepare your meals in advance. For example, a lot of people like to make all of their meals for the week during the weekend. Then it is just a matter of reheating the food throughout the week, which can be particularly helpful if you tend to be too tired to cook after a long day at work. So, after you make a diet plan for yourself, you could also make a schedule that dictates when you will have the time to cook the meals in advance. • You can create a list for grocery shopping, so you will know exactly what you need to purchase. This is a great way to avoid shopping while you’re hungry, which is a bad idea, and it can also prevent you from buying unhealthy foods. Staying focused at the grocery store means you will be able to buy the healthiest options and stay on track. • You will know exactly what is on the menu every day of the week when you make a diet plan for yourself along with a cooking plan. This means that you don’t have to spend any time trying to figure out what you will eat when you already have so many other things on your mind and so many other things to accomplish. In other words, this is yet another way to stay on track. • You will be able to avoid the tendency to grab some take-out or eat at a restaurant. Instead, you can enjoy homemade meals made from the freshest and most nutritious ingredients that are low in fat and calories. Now that you know a few of the key steps that are involved when you make a diet plan for yourself, you could approach this process with greater confidence and fewer questions. When in doubt, however, it is always a good idea to consult with your doctor or a qualified nutritionist. Those professionals can assess your health and your nutritional needs and assist you in developing your diet plan for the best results.